The researchers wanted to understand how adipocytes used copper. They did this by first growing mouse fat cell precursors in the laboratory that could be chemically signaled to grow into mature adipocytes — the kind used to store fuel. To determine whether loss of the copper-dependent SSAO activity was responsible for the change in size and fat accumulation by the copper-deprived cells, Yang engineered cells that lacked the enzyme entirely using genetic editing and monitored their development. 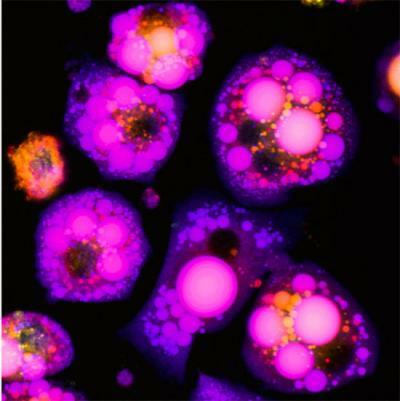 When chemically induced to become mature fat cells, these lab-grown mouse cells looked remarkably similar to cells deprived of copper in the earlier experiments — they grew to about twice the size of normal cells and contained more lipid. Other researchers involved in this study include Martina Ralle of Oregon Health & Science University; Michael J. Wolfgang, Neha Dhawan, Susana Rodriguez, G. William Wong and Norman Haughey of the Johns Hopkins University School of Medicine; Jason L. Burkhead of the University of Alaska Anchorage and Jack H. Kaplan of the University of Illinois at Chicago. This research was funded by the National Institute of Diabetes and Digestive and Kidney Diseases (DK071865, DK084171) and the National Institute of Neurological Disorders and Stroke (NS072241). COI: The authors have declared no competing interests exist.